To what extent was the Nazi movement suffused with pure theater? What explains the fascina­tion that Nazi symbols and Adolf Hitler himself had for millions, then and even today? Classic theater in Europe, especially drama, has always been viewed as serious literature, and Germany to this day has more theaters than any other country in the world. During the National Socialist period the Nazi Party made great use of theatri­cal techni­ques to embellish Party events. In Ibsen and Hitler, Steven F. Sage assesses the impact Henrik Ibsen’s plays had on the develop­ment of Adolf Hitler’s Welt­an­schauung and place in history. Sage, who completed the book as a scholar at the Center for Advanced Holocaust Studies of the U.S. Holocaust Memorial Museum, must be read with caution because he moves rapidly from Hitler’s appreciation of Ibsen’s plays, especially Emperor and Galilean, which is factual and convincing, to what the author considers the dictator’s slavish obsession and identification with the playwright’s other plots and characters, which is far less convincing. Always mindful that this book has been written to further traduce the National Socialist leaders of the period, nonetheless much of the material intro­duced is new to the American reader and well worth examining. 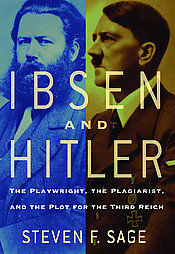 Ibsen and Hitler argues that there are much more than coincidental similarities between the characters and plot lines in Ibsen’s plays and the policies and speeches of Adolf Hitler. Indeed, textual analysis of passages from Hitler’s speeches and passages in the plays reveals parallels that could hardly be accidental. The three Ibsen plays upon which Sage bases his study are: Emperor and Galilean, The Master Builder, and An Enemy of the People. Emperor and Galilean tells the story of Julian the Apostate, a nephew of the Christian emperor Constantine the Great, and his foiled attempt to reinstate paganism in the Roman Empire. Ibsen considered Emperor and Galilean to be his magnum opus. It was first published in Norway in 1873 and was translated into German in 1899. To synopsize the play: Emperor and Galilean covers the 12-year (351–363 A.D.) transitional period when paganism existed side-by-side with the newly approved Chris­tian faith in the Roman Empire. Emperor Julian never accepted the Christian God and strove, if the opportunity arrived, to reinstate the Empire’s pagan gods and temples to their former high place. In Julian’s mind the spread of Christianity within the empire had already destroyed much of its glorious past. Julian hoped to stop the “cancer” of Christianity by befriending the Jews, the “elder brothers of the faith” even offering to rebuild their Temple in Jerusalem. This tactic, Julian believed, would also make the Jews an ally in the Empire’s war against Persia. A mystic, Maximus, informs Julian that in a vision he foresaw a “Third King­dom” or “Third Reich” that would combine the best of the first empire, based on Hellen­istic paganism, with the best of the then current second empire, based on Christianity.But before Julian could become Caesar and assume power, the Mystic tells him, he would first have to marry a “pure woman” and then have her sacrificed. When Konstan­zios, the current ruler, dies, Julian becomes Emperor and undertakes to introduce his reforms, which he insists, must be nonviolent. However, after only eighteen months as Emperor Julian is slain by a disgruntled Christian in his own ranks while leading a military cam­paign in Persia. In other words, Christ, not the Anti-Christ, has returned incarnate in the person of Julian the Apostate. The expected one is an avatar of Jesus, returned to disavow the dis­torted Christianity preached by the Church. Julian is the second coming of Christ, the Galilean (p. 31). Hitler, a theater enthusiast himself, took Ibsen’s play to the world stage in 1933. As Sage has it, Dietrich Eckard, a mystical seer (also a dramaturge) and perhaps the single most powerful influence on Hitler’s youth, takes the role of Maximus the Mystic in foretelling the coming of ‘the Third Reich.” Geli Raubal, Hitler’s half-niece assumes the role of the “pure woman” whom Hitler must first murder before taking power. The new Caesar/Emperor Adolf Hitler, called the Führer, was soon to become a god-like figure, revered by the great majority of Germans. At the end of the National Socialist period, following his defeat in the East, Hitler commits suicide and Christianity, followed by the Jews, again returns to Germany. The Galilean had won again. Hitler attempted to eliminate Christianity within Greater Germany by expelling the Jews and weaning the young away from Christianity by offering a more glorious and heroic future in a new dynamic pagan world. Drama and stagecraft surrounded Nazi pol­itical events and captivated the populace. Although the hope of the National Socialists was to see Judeo-Christianity lose in the competition with the new paganism, they approached the problem from the other direc­tion. Whereas Julian cultivated the Jews and suppressed the Christians, Hitler chose to eliminate the Jews (among other reasons) because he saw them as the source of Christianity in the expectation that the Christians would then whither away. In his research Sage has relied mostly on Hitler’s Table Talk (Tisch­gespräche) to confirm the fact that the German dictator was quite familiar with both Ibsen’s plays and Julian the Apostate. In October 1941 Hitler told his dinner companions: “I really hadn’t known how clearly a man like Julian had judged the Christians and Christianity. One must read this” (p. 112). In so saying, Hitler suggests that he had not read any of Julian’s own works prior to October 1941. Yet, his childhood friend August Kubizek recalled that Hitler had read Ibsen’s dramas in Vienna (Sage, p. 33), and Leon Degrelle, whom Hitler cherished as a son, claims that Hitler knew Julian the Apostate as if he had been his contemporary ( p. 115). Of course Hitler might have read books about Ibsen and quotations from his plays, without having seen or read the plays themselves. Thus, Hitler viewed Jesus as an Aryan at war against the Orthodox Jewry of the day. He probably also thought himself on a holy mission to rid the world of what he considered Judeo-Christian culture-destroyers. Sage then proceeds to find much more tenuous parallels. For example, he suggests just as when Julian turned his army away from the Persian capital and lost the war, Hitler turned his army away from Moscow to destroy Soviet armies in the south, and in so doing, lost the war. Sage believes that Dr. Stockmann in Ibsen’s Enemy of the People influenced Hitler in using the metaphor of germs, microbes or bacilli when referring to Jews. He compares Hilde Wangel’s death in the Master Builder to the death of Geli Raubal in Munich. Based on Ibsen’s Master Builder, Sage sees Hitler being influenced to act produce architecture as a setting for political theater which he realized through the work of Fritz Todt and Albert Speer. Todt, the architect of the Autobahn and other early National Socialist engineering projects, died a death similar to that of Ibsen’s master builder. Sage acknowledges that Ibsen comprised only one ingredient among many in Hitler’s mental mix ( p. 16). Among those whom Sage believes reinforced the German dictator’s already preexisting anti-Jewish mind-set was Rev. Franz Sales Schwarz, a Roman Catholic priest, whom Hitler thought was a Jew because the good Father could not tolerate his neopagan student (young Hitler) and tried to have him expelled from the Leonding school. He also cites the influence of Dietrich Eckart, who became a mentor and role model, and Richard Wagner, whose operas and opinions on the Jews enchanted Hitler. Notwithstanding the myriad of other factors responsible for the advent of World War II, Sage in his final paragraph asserts that Hitler either deliberately plagiarized or uncon­sciously through cryptamnesia or as a result of suffering from a mimetic syn­drome, memorized and used quotations, metaphors, and plot lines from Henrik Ibsen’s plays to dramatize National Socialist policies. Sage compares Hitler’s obsession with Ibsen’s plays to John Wilkes Booth identification of Lincoln with the tyrant Julius Caesar, John F. Hinkley’s obsession with The Taxi Driver, Ted Kacynski, the Unabomber’s identification with a character in Joseph Conrad’s The Secret Agent, and Timothy McVeigh inspiration from William Pierce’s The Turner Diaries. Sage claims that Hitler ruled in a similar obsessed state. As further evidence of this, Sage quotes from a public speech given by Hitler in March 1936: “I follow the path that Providence has chosen for me with the assurance of a sleepwalker” (p. 270). Although Hitler had little familiarity with Ibsen’s works before 1920, he was surely made more knowledgeable about his social importance through Dietrich Eckart, a successful playwright who adapted Ibsen’s Peer Gynt for the German audience in a successful run in Berlin. Hitler was so impressed by Eckart that he dedicated the second volume of Mein Kampf to him. The adaptation was made in such a way as to appeal to the German temperament of the day. It is much more likely that Hitler, as was his usual mode of reading, simply adopted those words or concepts of the playwright that reinforced his own already deeply ingrained opinions. All historians agree that Hitler possessed a prodigious memory and was quite capable of storing such information, incorporating it in his own philosophy, and unconsciously using it as his own. Julian has always been something of an underground hero in Europe. His attempt to stop Christianity and revive Hellenism still exerts a romantic appeal.